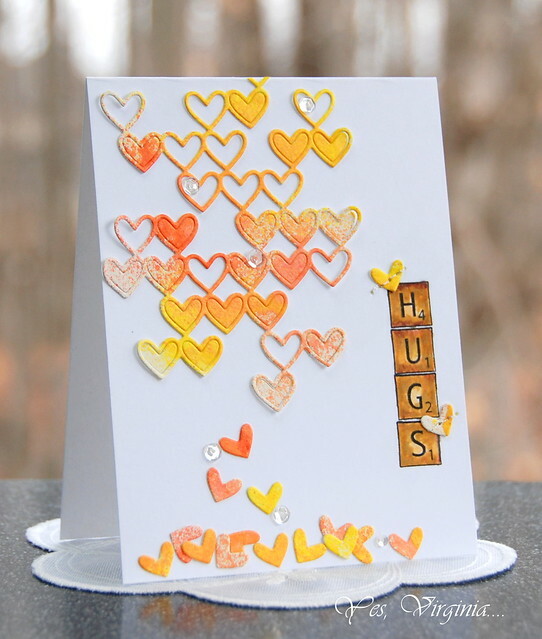 I just want to share a simple card with one die "Stacked Hearts"
and one stamp set "Game Tile Letters"
As for the paper? I sprayed the Canson Watercolor card stock with Heidi Swapp Color Shine. After letting it dry, I die cut it with Stacked Hearts. I then stamped the Game Tile and colored it with copics and Wink of Stella (gold). PS: if you'd like to see my daughter Stephanie's take on a Christmas card, please visit here. The heart die is on my radar screen, but I must have missed those cute and useful game tile letter stamps. I like the cascading effect as well. I'm really lovin' the way you're using this die. Thoought it was watercolored initially but spray...you really are brilliant. Looks good enough to eat and I adore it with these Scrabble looking tiles. AWESOME! Your card is the nicest "valentine" card I've seen. Excellent.